If you’ve ever launched a web site, you know that as it grows, you can experience growing pains. This is the case especially if you’ve given lots of people access to the site to make whatever changes they need to make. Without preset limitations, users can display content in any order and in any manner they desire (think huge, flashing letters in a font nobody can read). Content can get stale, especially if those responsible for it don’t maintain it like they should. And sometimes, content is published that should never have seen the light of day. Thankfully, Liferay WCM helps you handle all of those situations. You can use Structures to define which fields are available to users when they create content. These can be coupled with Templates that define how to display that content. Content won’t get stale, because you can take advantage of the Scheduling feature to determine when content is displayed and when it’s removed. Additionally, you can configure Liferay’s built-in Workflow system to set up a review and publishing process so only what you want winds up on the live site. Liferay Portal gives you the management tools you need to run everything from a simple, one-page web site to an enormous, content-rich site. All of this starts with structures. Structures are the foundation for web content. They determine which fields are available to users as they create new items for display. Structures not only improve manageability for the administrator, they also make it much easier for users to quickly add content. For example, say you’re managing an online news magazine. All your articles need to contain the same types of information: a title, a subtitle, an author and one or more pages of text and images that comprise the body of the article. If Liferay only supported simple content as has been described above, you’d have no way to make sure your users entered a title, subtitle, and author. You might also get articles that don’t match the look and feel of your site. If titles are supposed to be navy blue but they come in from your writers manually set to light blue, you need to spend time reformatting them before they are published. Structures give you the ability to provide a format for your content so your users know what needs to be entered to have a complete article. Using structures, you can provide a form for your users which spells out exactly what is required and can be formatted automatically using a template. You create a structure by adding form controls such as text fields, text boxes, text areas (HTML), check boxes, select boxes and multi-selection lists. Also you can add specialized, Liferay-specific application fields such as Image Uploader and Documents and Media right onto the structure. Furthermore, you can move the elements around by dragging them where you want them. This makes it easy for you to prototype different orders for your input fields. Additionally, elements can be grouped together into blocks which can then be repeatable. Template writers can then write a template which loops through these blocks and presents your content in innovative ways, such as in sliding navigation bars, content which scrolls with the user and more. Let’s look at how we can create and edit structures through the Manage Structures interface. Go back to the Control Panel and select Web Content from the content section. The first way to access the Manage Structures interface is simply by clicking Manage → Structures. This opens a popup showing all the web content structures that exist in your currently selected scope. Here, you can add new web content structures, edit existing ones, manage the templates associated with a structure, edit the permissions of a structure, and copy or delete structures. Copying web content structures can be useful if you’d like to create a new web content structure that’s similar to an existing one, but you don’t want to start from scratch. Liferay generates a unique portal ID for the copied structure, but every other attribute of the copied structure, including the name, is the same as that of the original. Once you’ve copied a web content structure, you should enter a new name for it to avoid confusing it with the original. When you copy a web content structure, you’ll be prompted to choose whether to copy any detail templates or list templates associated with the structure. For information on detail templates and list templates, please refer to chapter 9 on Dynamic Data Lists. Figure 3.1: You can access the Manage Structures interface by clicking Manage → Structures from the Web Content page of the Control Panel. 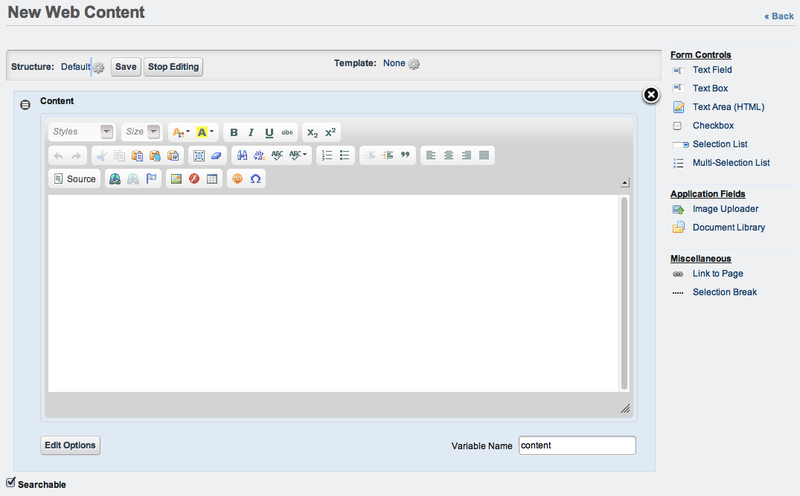 The second way to access the Manage Structures interface is directly from the web content article WYSIWYG editor. Click Add → Basic Web Content from the Web Content page to add another piece of content to your portal. Instead of going right for the content, this time we’ll first create a structure. To access the Manage Structures interface, simply click on Select next to the Structure heading near the top of the page. To create a new structure in your chosen scope, simply click on the Add button in the Manage Structures popup. It’s very easy to create and edit structures: all you have to do is drag elements into the structure and then give them names. For instance, select the Checkbox element under the Form Controls tab and drag it onto the structure. You can do the same with any of the elements. To remove it from the structure, simply select the Delete icon (black circle with X) in the upper right corner of the element. Take a moment to add, delete and rearrange different elements. Text Field: Used for items such a titles and headings. Text Box: Used for the body of your content or long descriptions. Text Area (HTML): An area that uses a WYSIWYG editor to enhance the content. Checkbox: Allows you to add a checkbox onto your structure. Template developers can use this as a display rule. Selection List: Allows you to add a select box onto your structure. Multi-selection List: Allows you to add a multi-selection list onto your structure. Image Uploader: Allows you to add the upload image application into your structure. Documents and Media: Allows you to add the Documents and Media folder hierarchy to your structure. Link to Page: Inserts a link to another page in the same site. Selection Break: Inserts a break in the content. These form elements provide all you need to model any information type you would want to use as web content. Liferay customers have used structures to model everything from articles, to video metadata, to databases of wildlife. You’re limited only by your imagination. To fire that imagination, let’s look more closely at the form elements. When creating a new structure, it is essential that you set variable names. Template writers can use these variables to refer to elements on your form. If you don’t set variable names, Liferay generates random variable names and these can be difficult for a template writer to follow. For example, consider a field called Author. You might create this field in your form but the underlying variable name in the structure might look something like TextField4882. The template writer needs to create markup for your structure and place the Author field in a certain spot in the markup. How will he or she know which field is Author when they’re all named randomly? To solve this problem, all you need to do is set a variable name for each field as you add it to your structure. Let’s do this now. In your structure, add an element Text Area (HTML) which has the Field Label Instructions. If we wanted to give it the variable name Steps, we can do it very easily: at the bottom of every form element is a Variable Name field. Replace the generated name with the name you want to use. Now your template writer has a variable by which he or she can refer to this field. Field Type: changes the field type, in case you dragged the wrong field type to this location in the form. Field Label: changes the displayed label for the field. Index Type: Choose how you want Liferay to index your field for search. You can have it indexed by keyword, which filters out common words such as and, but, the, and so on, or you can have it index the full text of the field. By default, indexing is turned off. Predefined Value: Specifying predefined values for structure forms is a way to specify defaults. When a user creates a new web content article based on a structure that has predefined values for various fields, the predefined values appear in the form as defaults for those fields. Instructions for the User: Check this box and type a description of what the field is for to display it as a tooltip for the user. Repeatable: If you want this field to be a repeatable element, check this box. Your users can then add as many copies of this field as they like. For example, if you’re creating a structure for articles, you might want a repeatable Author field in case you have multiple authors for a particular article. Required: Check the box to mark the field required. 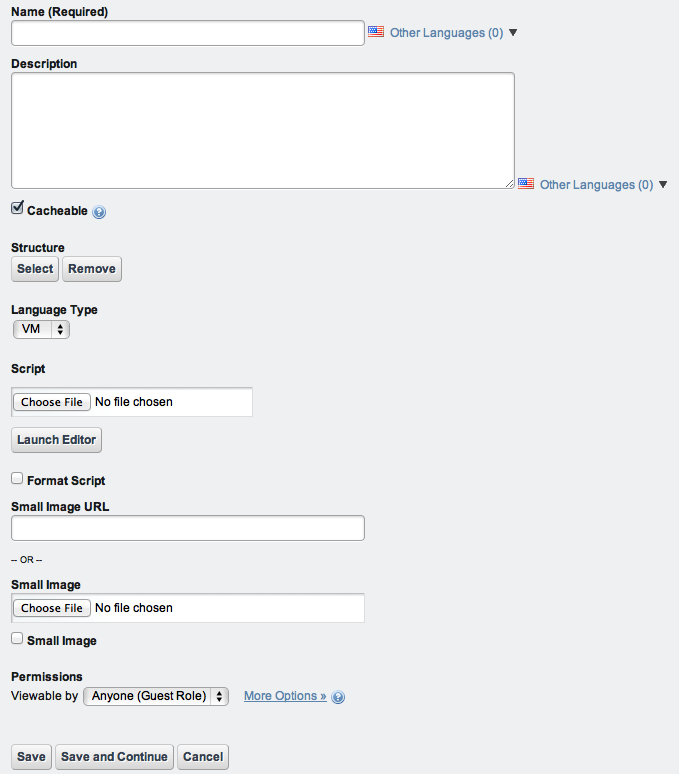 If a field is required, users must enter a value for it in order to submit content using this structure. For the Nose-ster structure, type something in the Instructions for the User field that helps users know what to put into the Body element (example: this is an HTML Text area for the body of your content). Also enable the Display as Tooltip box. Now, when users hover over the Help icon near your title, your instructions are displayed. Structure Default Values allow you to create one structure that uses common data from multiple articles. 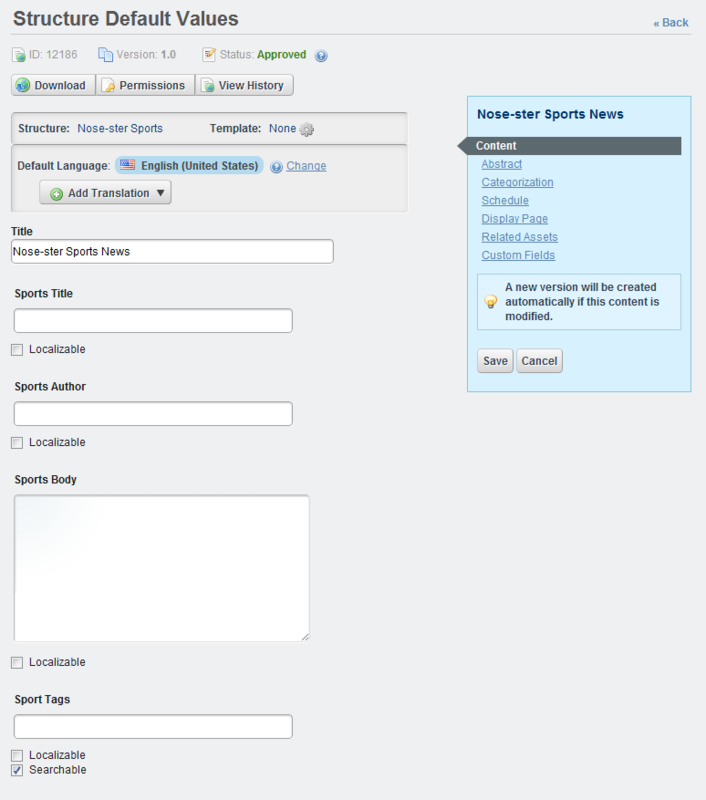 Returning to our newspaper scenario again, let’s say you want all sports articles to have the same display page (sports page), the same categories, or the same set of tags. Instead of adding them for each article or wondering if your users are adding them to every web content, you can add these characteristics once for every sports article by creating default values for the structure. There are two ways to edit structure default values: creating a new structure or editing an existing structure. For a new structure, you must first create the structure before editing its default values. Navigate to Web Content in the Control Panel and click the Structures tab, then select the Add Structure button. Under the XML Schema Definition section of the new structure form, use the Add Row button to create different types of fields for the structure. Or you can use the editor to create the structure manually: the Launch Editor button allows you to edit the XML for the structure if you wish to do it via code. When you are done, click Save and Continue to go to the Structure Default Values form. Figure 3.3: You can create fields for structure default values via the XML Schema Definition section of the new structure form. To edit an existing structure, go to Web Content in the Control Panel and click the Structures tab to see the structures list. Find the Actions button for the desired structure and select Edit Default Values from the menu to view a window like the one below. This form allows you to manage the structure settings. Figure 3.4: You can edit default values via the Actions button of the structure form. Every new web content you create with this structure is preloaded with the data you inserted. Setting permissions on structures is done using the same procedure as permissions everywhere else in Liferay. Most users should not have the ability to edit structures. Structures are coupled with templates, which require some web development knowledge to create. This is why only trusted developers should be able to create structures and templates. Users, of course, should be able to view structures. The View permission enables them to make use of the structures to create content. You can grant or deny permissions based on Roles and this is the recommended way to handle permissions for structures. Now that you understand what structures are used for, you need to understand the other half of Liferay’s web content management system: templates. Developers create templates to display the elements of the structure in the markup they want. Content can then be styled properly using CSS, because markup is generated consistently by the template when structured content is displayed. In essence, templates are scripts that tell Liferay how to display content in the structure. Any changes to the structure require corresponding changes to the template, because new or deleted fields produce errors on the page. If users enter content into a structure, it must have a matching template. Without a template, the portal has no idea how to display content which has been created using a custom structure. Let’s look more closely at the types of templates Liferay supports. Liferay supports templates written in four different templating languages, to support the skill sets of the largest number of developers. This increases the chances you can jump right in and use whichever one you’ve already used before. If you haven’t yet been exposed to any of them, your best bet is Velocity or Freemarker, as they are less “chatty” than XSL and extremely simple to understand. VM (Velocity Macro): Velocity is a scripting language that lets you mix logic with HTML. This is similar to other scripting languages, such as PHP, though Velocity is much simpler. Because it’s been in the product the longest, it is probably the most widely used language for templates in Liferay WCM. If you haven’t used any of the template languages before, we recommend using Velocity: you’ll get up to speed the fastest. XSL (Extensible Style Sheet Language): XSL is used in Liferay templates to transform the underlying XML of a structure into markup suitable for the browser. While it may not be as clean and compact as Velocity or FTL, it’s widely used for transforming XML into other formats and it’s very likely your developers have already been exposed to it. FTL (FreeMarker Template Language): Freemarker is a templating language which could be considered a successor to Velocity, though it is not yet as popular. It has some advantages over Velocity for which it sacrifices some simplicity, yet it is still easy to use. CSS (Cascading Style Sheets): You can use CSS if your structure is very straightforward and modifications are simple (colors, fonts, layouts, etc.). If your structure is more complex, however, you’ll need to use one of the other options. Liferay WCM makes it easy to create structures, templates and content from the same interface. Let’s go through the entire flow of how you’d create a structure, link it to a template and then create content using them both. We’ll use Velocity for our template and we’ll lay out the structure fields systematically to go along with the format we’ve defined for our content. Go back to the Web Content section of the Control Panel and click Add → Basic Web Content. Click Select next to the Structures heading to access the Manage Structures interface. Name the structure News Article and click Save. Back on the Manage Structures interface, click Actions → Manage Templates next to the News Article structure that you created. Enter the name News Article and add a description. Make sure Velocity is selected as the script language (it’s the default). If you’ve written the script beforehand, you can select Browse to upload it from your machine. Otherwise, you can click Launch Editor to type the script directly into the small editor window that appears. Select the News Article structure. On the New Web Content form, you’ll see the Title, Abstract, Image, and Body fields that you defined for the News Article structure. The News Article template should also be selected. Populate the fields and click Publish to publish your News Article. This template is pretty small but it actually does quite a bit. First, a portlet URL which maximizes the portlet is created. Once this is done, the template gets the namespace of the portlet. This is important to avoid URL collisions with other URLs that might be on the page. If the template got the read_more parameter, it displays the abstract and the body below the title (which is always displayed). If the template didn’t get the read_more parameter, it displays the image, the abstract and the link created above, which sets the read_more parameter. Now that you’ve created a handsome template, it’s time to decide who the lucky people are that get to use it. Permissions for templates are similar to permissions for structures. As with structures, you only want specific developers editing and creating templates. You may, however, want to make the templates viewable to some content creators who understand the template scripting language but are not directly writing the scripts. You can determine who views the template by selecting from the Viewable By select box beneath the Permissions tab. By default the Anyone (Guest Role) is selected. You’ll also want to determine how users can interact with the template. You can do this by selecting the More link. From the More link, you can grant or deny permissions based on Roles. For instance, you may create a role with the ability to update the template and create a second role that can both update and delete. Liferay Portal makes it possible to assign permissions based on the roles and responsibilities within your organization. Now that you understand the role structures and templates play in creating web content, let’s look at how you can use Liferay to manage multiple sites.